Food, Glorious Food | SoHo Memory Project. 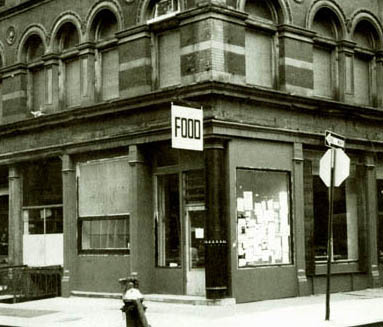 The restaurant Food opened in late 1971 at 127 Prince Street at the corner of Wooster. 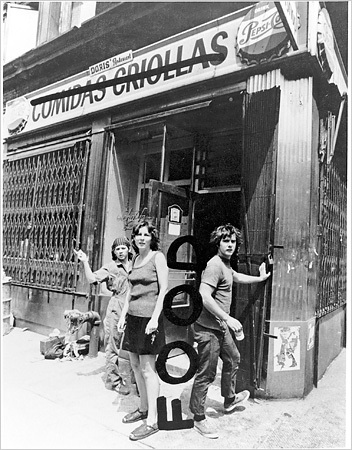 It was a place that employed struggling SoHo artists and served inexpensive but hearty food to the local community, at least at first, until it was written up somewhere and became a destination spot for uptowners as well as out-of-towners. Although some people do not remember it so fondly for a variety of reasons—the owners were unfriendly, the food was overrated, etc.—I think most people miss it. It was, for a long time, one of the only places to eat in SoHo other than Fanelli's and a few greasy spoons. It was also WAY ahead of its time in that it served fresh, seasonal foods cooked using local ingredients in an open kitchen. This may be de rigeur these days, but back then it was virtually unheard of. I LOVED going there as a child. Those chunky soups, the thick, yummy slices of wheat bread with sweet butter ("fancy" butter to me—I was raised on salted butter), and those enormous slices of carrot cake big enough to feed a family of four! And for my friend, Ingrid, it was her first place of employment after moving to New York from Germany. "I think they paid me five dollars an hour, which was a lot of money," she remembers. Working only part-time, she was able to support herself and her young daughter on those wages. Ingrid would bring her daughter to work in the morning at 7 AM, where she would sleep curled up on Ingrid's coat on the floor until it was time to catch the school bus on the corner of Prince and West Broadway, in front of the bodega (more on that soon—that bodega deserves it's own post). That was the mid-1970's. The original owners of Food moved on and apparently handed it over (for no money) in 1974 to one of Food's waitresses, and after that the restaurant changed hands several times. It kept its name and general theme, but it was transformed from a cooperative into a profit-making enterprise and by the late-1970's it had long lost it's homey-ness. I still went there often, however. In the early 1980's, I was finally old enough to go to restaurants on my own, and I would bring my Stuyvesant friends there and they just thought I was soooooo cool for introducing them to a real bohemian hangout. Unfortunately, it was actually more like a stop on a SoHo "reality tour," similar to when the double-decker bus stops at the Jamaican beef patty place on Flatbush for a "true" Brooklyn experience. Food closed its doors shortly after I started high school, so I guess around 1985. Although the more popular it became, the farther it moved from it's original incarnation, Food was a consistent fixture in my childhood and adolescence, a place with big pieces of delicious cake that I only ever saw through a child's wide eyes.